This extra-wide smooth 2.5" leather strap evokes a gridiron feel with its industrial-style detailing and sturdy construction, but it also features appointments that evoke the classic look and feel of Fender. Fully adjustable length (44"-55") provides versatile fit for most players. 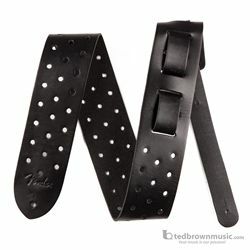 Perforated holes along the wide portion of the strap and embossed Fender logo add sleek stylistic detail. Fender logo stamp on strap end provides an added touch of authenticity.